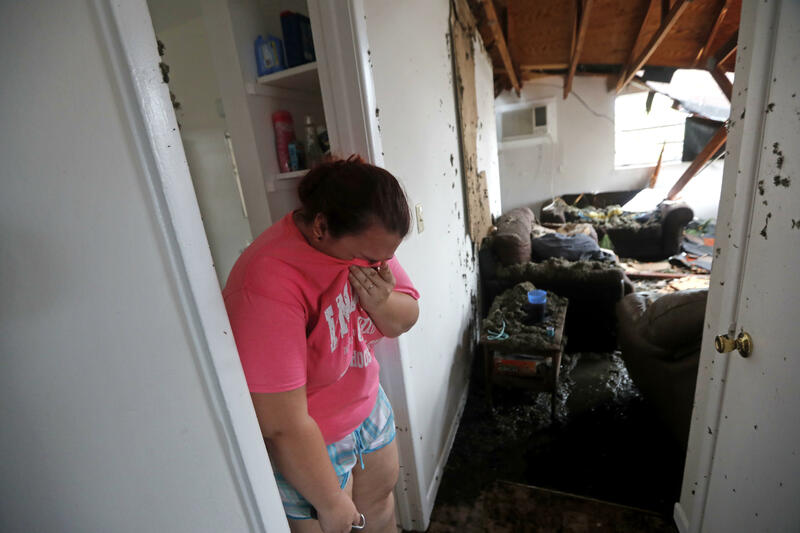 PANAMA CITY, Fla. — Amy Cross has a hard time explaining the stress of living in a city that was splintered by Hurricane Michael. She's fearful after hearing gunshots at night, and she's confused because she no longer recognizes the place where she's spent her entire 45 years. "I just know I don't feel real, and home doesn't feel like home at all," Cross said. It's not hard to imagine: Just getting to the treatment site involves navigating streets with roadblocks and fallen utility lines, and the hospital building itself was ripped open by Michael's powerful winds. "In any kind of disaster what we find is that people have been exposed to circumstances that are well beyond what they normally deal with day to day," said Averbuch, of Bloomfield Hills, Michigan. "We're in shock. This is a lot. It's heartbreaking," she said. Signs of trauma aren't a surprise for those who studied people after Hurricane Katrina in 2005. Damage in Mexico Beach was similar to that in southern Mississippi, where entire communities were flattened by wind and storm surge, and Panama City could take years to rebuild, as did parts of New Orleans after the metro area flooded. Dr. Irwin Redlener of the National Center for Disaster Preparedness at Columbia University observed widespread, long-lasting psychological effects after Katrina. One study found that, five years after the storm, parents reported more than 37 percent of children had been clinically diagnosed with depression, anxiety, or a behavior disorder. Redlener says that's in part because parents are overwhelmed and are less able to buffer their children from bad experiences. "They survived a major catastrophic event, which is good. But everything they knew is gone," he said. "If they see parents kind of falling apart at the seams, that's going to create anxiety for the children as well," said Murphey. Dr. Emily Harville, an associate professor at Tulane University's School of Public Health and Tropical Medicine in New Orleans, said most people will be back to where they were within a year or so, but others will have difficulty for a longer period. "There will be a small group that continues to have long-term mental health issues," she said. Panama City Mayor Greg Brudnicki said a high school football game played Saturday afternoon was part of an effort to re-establish the familiar patterns of life, to "create normalcy" in a way that would help people feel more at ease in a town devastated by the hurricane. "People have been stressed. They've had no means of communication, no utilities. It's been hard. But we've worked very, very hard to create an environment that makes it as good as possible," said Brudnicki. The game was a pick-me-up for many. Missy Guynn, an English teacher at Mosley High School, got to hug students she hadn't seen or heard from since before Michael. "I was worried about them. It was kind of good to see them, to connect with them today and see that they're all right," she said. "It's a really sad thing for this to happen, but it's brought everybody together," she said. "It's going to make this town a bigger and better place."